Last week a good friend celebrated a birthday. Another friend brought a video camera along to capture the best wishes of her loved ones and friends. Anticipating that my turn would come and knowing that I’d not know what to say, I whispered to the birthday girl that I had already written on her birthday card what I meant to share with her. Sure enough, when the camera stopped in front of me, all I could manage was a “Happy Birthday” and “We love you”. I’m finding myself equally tongue-tied trying to write this post. Several discarded drafts later, all I want to say is this: This, my first food-blogging year, has been difficult, challenging, exhausting, addictive, entertaining, mind-opening, heartwarming, and most of all, fun. The sheer enjoyment of connecting with so many nice people, readers and fellow bloggers alike, has far outweighed the challenges I’ve faced due to my inexperience with photography and my limited knowledge of computer technology. And guess what? Eventually I stopped being intimidated by my camera and started to have fun with it. The technical obstacles remain but I like doing this enough to plow through them. To me, this has been a wonderfully successful first year. Thank you for your continued support by coming back post after post. Your comments? They make my day. Believe me, doing this is much more fun when you know someone out there actually cares what you have to say. To celebrate my first blog anniversary, I thought it would only be fitting to make a cake. Not any cake, mind you. I wanted to have a cake that includes my current obsessions: banana, caramel and chocolate. This one had them all and I was happy to find the recipe in The Essence of Chocolate, the book I won along with the million pounds of Scharffen Berger chocolate from Tastespotting’s fabulous giveaway. It’s essentially a spice cake with chocolate, diced bananas and chopped pecans folded into the batter then baked and drizzled with hot caramel. Though the chocolate had only a supporting role in this cake, it took the banana flavor to new heights. The recipe called for using a 12-cup (10-inch) Bundt pan but I used a 6-cup pan for half the batch and made 12 mini square cakes with the rest. But before I blow out the candle, I want to give you a gift. It’s my way of saying thanks for continuing to visit. Remember my previous post? Well, I have a book to give to you. I have a second copy of Michael Chiarello’s Bottega. Having just sampled what his restaurant has to offer, I’m confident that you will enjoy cooking from it as much as I will. All you have to do is share with me your absolute favorite cake. That’s all. I’ll pick a winner via random number generator next week. The deadline for your comments will be Wed, March 23 at 6 pm PDT. Lastly, when I published my first post a year ago, I shared a picture of me in Dublin with a Guinness in hand. It was St. Patrick’s Day after all. 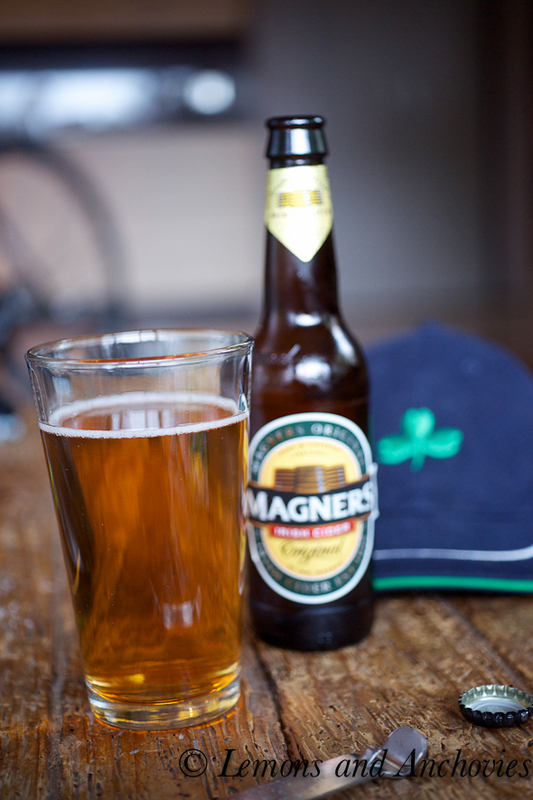 I can’t let this day pass without sharing with you one of my favorite Irish drinks, Bulmers (aka Magners in America). It’s a hard cider, light, crisp and refreshing. I was lucky to find it in stock in one store (BevMo, thank you!). Happy St. Paddy’s Day! Preheat your oven to 350ºF. Butter and flour a 12-cup (10-inch nonstick Bundt pan. I used a 6-cup pan and a square mini-cake tray. Combine the dry ingredients for the cake from the flour to the baking soda in a medium bowl. Using a stand mixer fitted with the paddle attachment, mix the eggs, oil, granulated sugar, vanilla and almond extract over medium speed until thoroughly combined. Scrape the sides of the bowl as necessary. Mix in the dry ingredients about 1/2 cup at a time, again, scraping the sides of the bowl as necessary. Fold in the pecans and chocolate then carefully fold in the diced bananas. Try not to overmix. Pour the batter into the prepared pan. For reference, I used half of the batter for a 6-cup Bundt pan and the other half was sufficient to make 12 mini-cakes, each about the size of a cupcake. For my square cakes, I lined each slot with strips of parchment paper to make them easier to pull out of the tray. For the 12-cup Bundt pan, bake for 50 minutes to an hour or until a skewer inserted into the cake comes out clean. For my smaller pan, it took about 25 minutes. For the mini cakes, about 12-15 minutes. Five minutes before you take the cake out of the oven, prepare the caramel by combining the three ingredients in a small saucepan. Bring the mixture to a boil over medium heat, swirling the pan occasionally as the butter and sugar melt. Remove from heat once it reaches an amber color. Remove the cake from the oven and poke holes with a skewer all over the surface of the cake. Pour the hot caramel on top, poking more holes and pushing the cake slightly away from the sides of the pan to allow the caramel to soak through. Cool slightly on a rack before unmolding onto a serving platter. Happy first year Jean! I cant believe it’s been only a year and you produce such beautiful pics and food! Can’t wait to see what the new year brings! Congrats on 1 year! I enjoy your blog, I have been following it for a couple of months now. It is simple but full of culture which is a nice breath of fresh air! My favorite cake is my grandmothers Sour Cream Pound Cake. Your banana cake looks yummy. I just made an baileys irish cream pound cake for St. Patrick’s day. So that is my current fave. Thanks for having the giveaway. 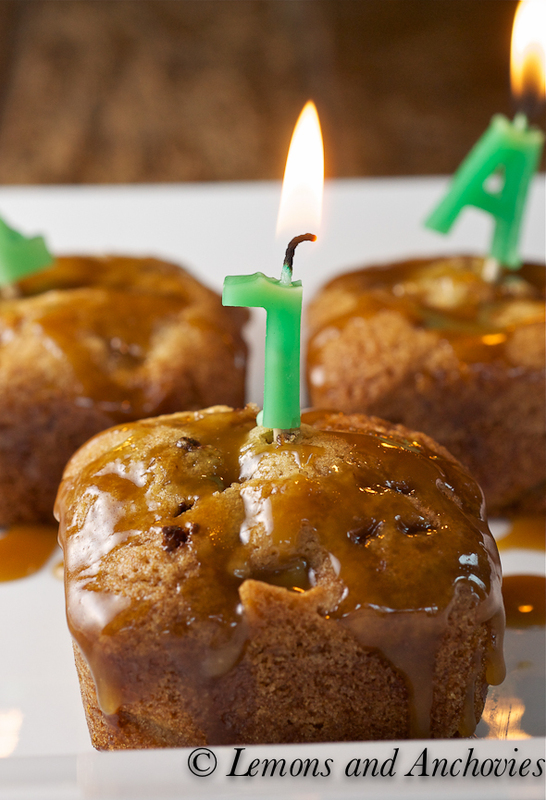 Happy Birthday to your one-year-old blog! That is so cool that you got to meet Michael and what a wonderful giveaway to offer your readers. Banana and caramel are a wonderful pairing! My all-time favorite cake is a chocolate chiffon toffee cake that I posted in September of 2009. It’s sooo good! And just a point of information – in the UK at least Magners and Bulmers are different kinds of cider, and either or both might be available to buy, with different prices etc. I think they taste different as well, although I’m not very discerning when it comes to cider. my favorite cake is a Hummingbird cake that I first had in Ocracoke Island. It’s hard to find but I dream of making my own recipe for one soon. I’m currently obsessed with chocolate and bananas together in any form, so this post comes at a perfect time! Also, hard cider is also one of my favorite drinks (though I like Strongbow as much as Magners – I drank both when I visited the UK). Happy Anniversary! I think you picked a great cake to celbrate with!! Happy anniversary! What a great way to celebrate – here’s to many more. Congrats on your one year of blogging! This cake is the perfect way to celebrate, its goregeous! I think my favorite cake right now is a jammed filled browned butter cake that I’ve made several times over the past couple of months. So good! Happy blog birthday! This cake looks like an amazing way to celebrate one year! Here’s to many more! Happy blogaversery ! 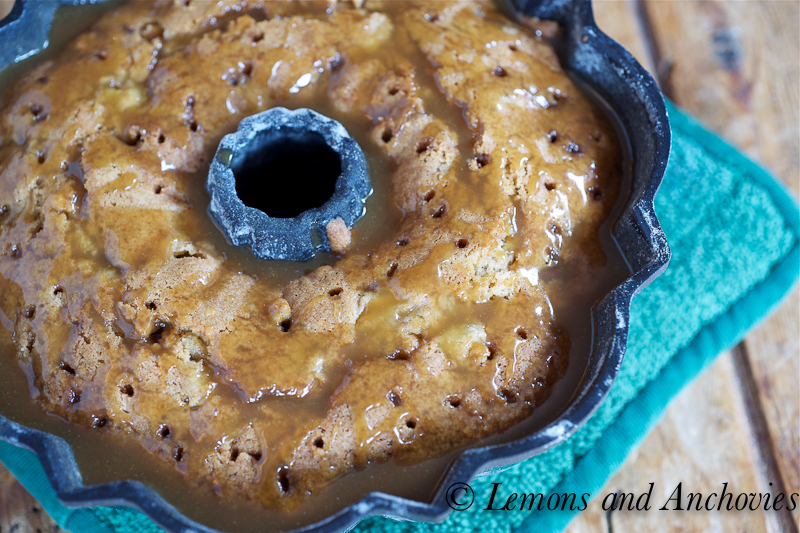 Your banana caramel cake looks deffinatly awesome, and delicious! What a delicious what to celebrate. Happy blogiversary! The caramel sauce is definitely the cherry on top. Happy Anniversary! I’m also celebrating my blog’s first birthday this week…it’s amazing how much we’ve learned in a year! PS…love your cake…the addition of caramel is fabulous! my favorite cake is homemade funfetti! Your post alone just gave me a major sweet tooth. Love your photos and the banana caramel cake recipe is after my heart. Yum! I’ll have you know I’ve been sipping Magners cider all day with my family in Florida. Magner was my grandmother’s last (maiden) name. We all love that drink. So glad you do too. Happy one year blog-iversary!!! I always look forward to your engaging posts. Let’s get together soon! Congrats!!! My favorite cake…I’d have to say vanilla cake with vanilla buttercream! Happy Blogoversary! You know how to celelbrate! Love all the ingredients and the caramel looks good enough to lick the screen. My favourite cake? Anything chocolate. Jean, Happy Birthday! 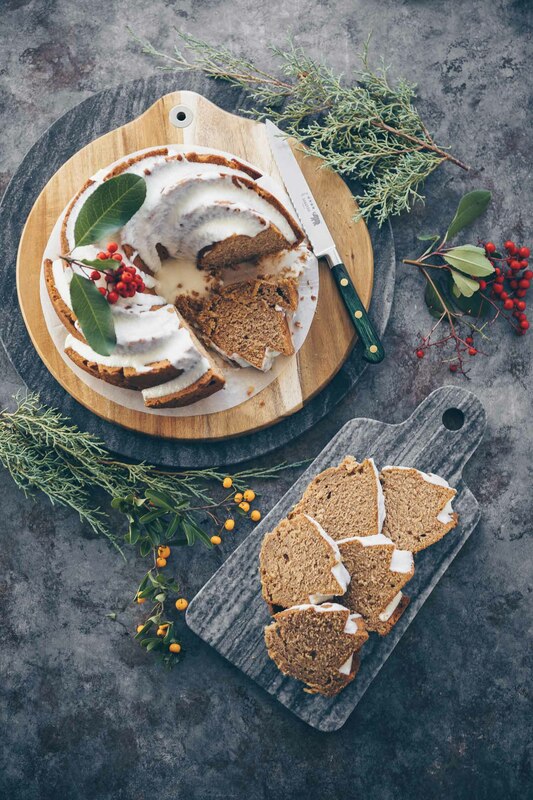 I am looking forward to another wonderful year of sharing recipes and beautiful photos. I love the combination of bananas and chocolate, and the caramel can only make it more sinful and therefore better! My favorite cake is the one my mom made when Husband and I got married – she calls it Napoleon torte and it has layers of coffee soaked thin cake batter, crunchy caramel, coffee infused creme anglaise and chocolate ganache on top. Congratulations on your first year, Jean! It’s amazing when you look back to your very first post, isn’t it? So much have changed since then and so many things have stayed the same. Here’s wishing you plenty more years of blogging! Congrats on the year of blogging. I think my favorite cake is the kind we get from the Italian bakery that layers fruits and fresh whipped cream in between cake soaked in rum. Many congratulations on your blogiversary Jean!! So happy we got to know each other this year. Love your site and the fine job you do all the time. Your recent post wished me to travel to wine country in Northern california. Oh my goodness and a giveaway too. Love the book unfortunately I do not own it!! Happy happy happy blog birthday, Jean! If not for the world of food blogs, I might have never met you and I am so incredibly thankful. I have loved getting to know you and can’t wait to see what this next year of blogging will bring. Here’s to another delicious year! Congrats on your first year! 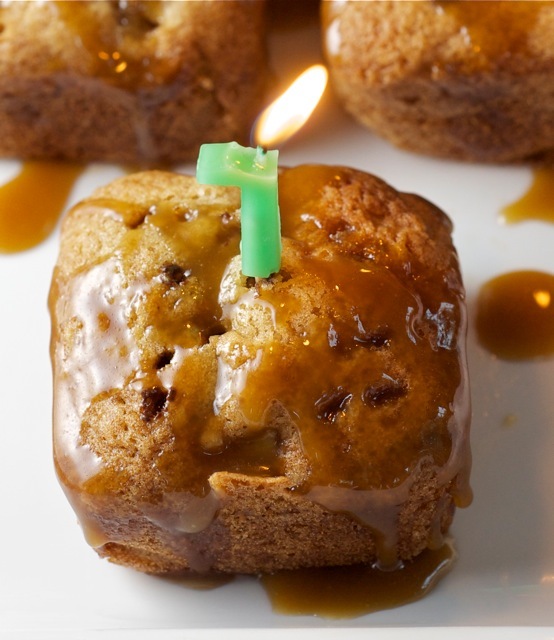 The banana caramel cake sounds delicious and like the perfect celebration dessert. Congratulation son hitting the first milestone my friend! first one always remains special but you have many mor eto go and I’m sure you’ll go places with your lovely blog. Congrats Jean on your 1 year anniversary!! You’ve made it longer than a lot of celebrity marriages! Thanks for sharing your food with us. I can hardly believe you’ve only been doing this for one year. 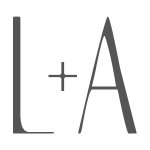 Your blog is just stunning, and I love visiting, week after week! And of course, you couldn’t make me happier with this cake. I love bananas! My favorite cake is an apple walnut spice cake. So good! Thank you for sharing this delicious treat. I hope you have a beautiful Friday. The weekend is nearly here! Happy Blogversary! 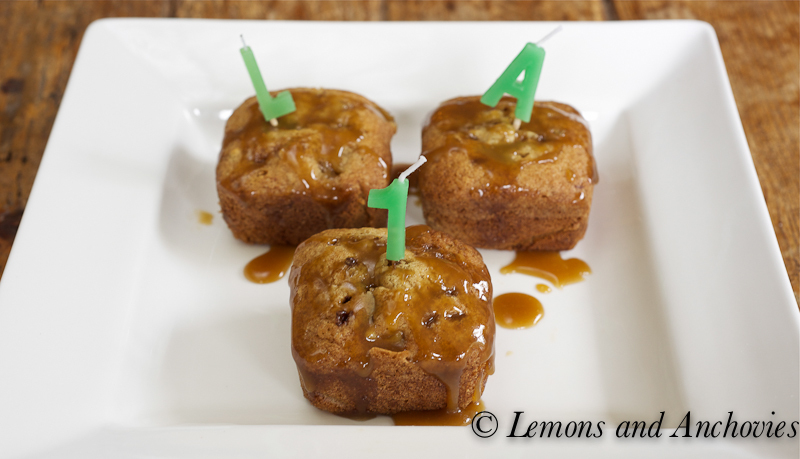 My favorite cake is banana cake, but after I try this one with caramel too this may become my new favorite. Congrats! My favorite cake is Carrot Cake with Cream Cheese Frosting. 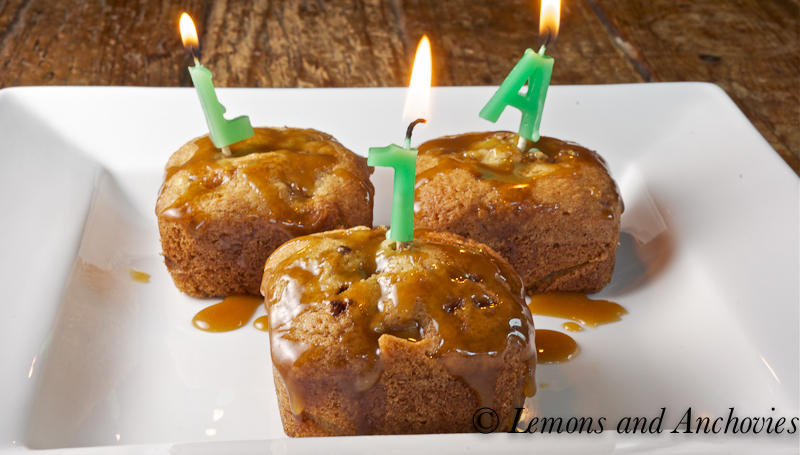 Happy birthday, Lemons and Anchovies! It seems that you’re more like 6 or 7 in blog years. 🙂 I remember yours being among the first blogs that I really connected with. I’m so happy to have met you, Jean. Also, for all your aw shucksing about the camera, your photos are consistently beautiful. Happy Blog Anniversary! What a delicious way to celebrate. Many congrats on the blogiversary – and on the baking of a delicious-looking cake! 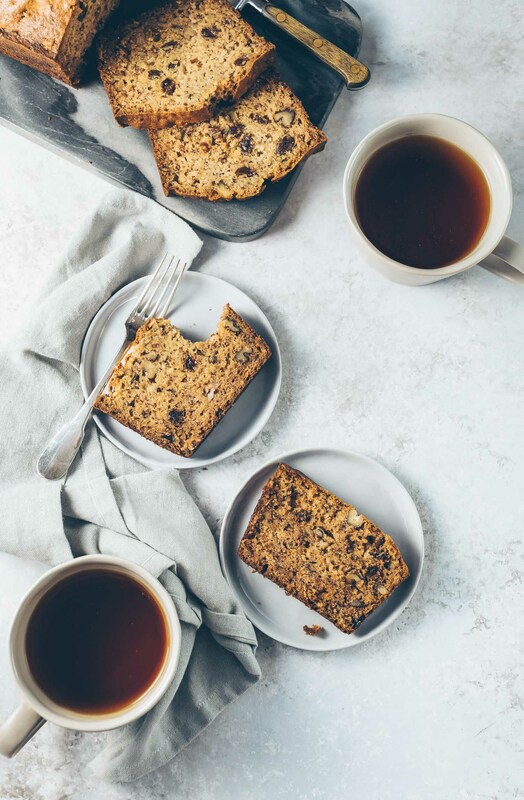 This looks like a really great take on banana cake – already one of my faves. Hi Jean! Congrats and happy 1st blog birthday! I actually forgot mine after much anticipation. 🙂 I enjoyed your last post about your friend’s dinner and I used to watch Michael on TV but I think he was younger when he filmed those episodes. I didn’t recognize him in the picture at first! My favorite cake is one I don’t know how to make – a chocolate doubash cake from the Hawaiian King’s Bakery. How could I get them to share the recipe?!? 🙂 Congrats again, Jean and I’ll look fwd to your blog makeover. Happy to have met you and I enjoy our friendship. Have a great weekend! Cheers! Happy Blogiversary!! Each and every emotion you mentioned above applies to me as well, you said it so nicely. I’ve truly enjoyed getting to know you through your blog and I look forward to your posts. As for the cake… wow!! My daughter loves anything banana, but adding chocolate and caramel would make her even happier. Nicely done!! 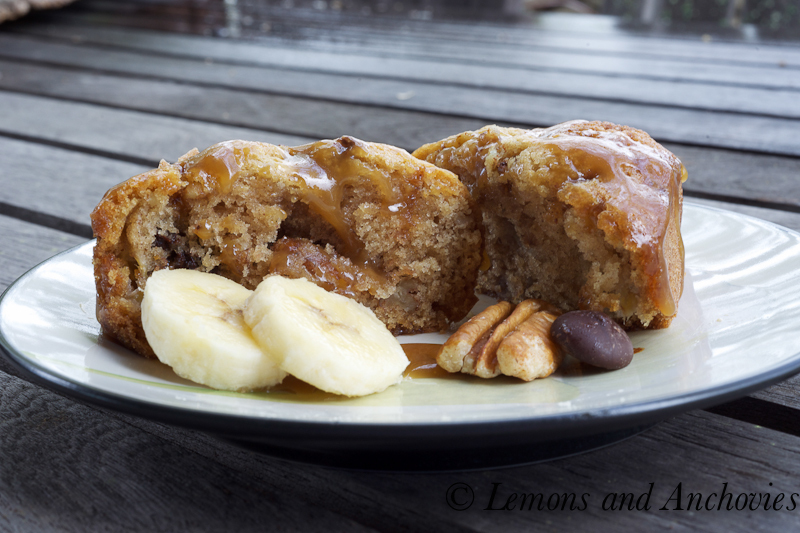 The banana cake with drizzled with caramel looks sensational! That cake looks SO delicious! and banana and caramel is always a winning combination. Congrats on your first year! So exciting! This cake looks phenomenal and I’m sure if I made it, it would certainly shoot up to the top of my list! As of right now, though, I’m in love with a local bakery’s Tiramisu cake! Happy one year Lemons & Anchovies! Congrats on 1 year! Although I’ve been reading your blog just for the last months I enjoyed every post and looking forward to lots more. The cake sounds beyond perfection. i’ve tried banana and chocolate but adding caramel makes it to die for. Thanks for sharing Jean. Happy Anniversary; I look forward to many more years of reading your informative and inspiring blog. I would love a copy of the Bottega cookbook. My favorite cake for a long time has been Coffee Cake….with lots of nuts and cinnamon! First of all: happy 1st blog-versary! I loved the long list of adjectives that you used to describe this year. If I weren’t blogging myself, I could not understand how so many and apparently contradicting adjectives can stay together! But we do need them all to give the full picture. And yet, you are right…most of all it’s fun! Second: oh my! Now I understand your comment on my banana bread! I understand your banana-caramel obsession. They are just wonderful together and these cakes are simply the perfect treat for such a huge even! Have a great weekend, Jean. I’ll always be here, looking forward seeing what you will bring us in the next 100 years of blogging! This is a wonderfully delicious way to make banana cake ! Great write up and love the photos. I am hungry again. Congratulations on your blogging anniversary! Congratulations on your first year. I’m looking forward to this one and the next and the next. and my favorite cake is strawberries and cream. I was lured to your blog by the its name when I found it in the bake sale list we are both participating. Why? Because a favorite recipe of mine that I recently posted has lemon and anchovies in it and I fall in love with the combination again every time I eat it. You may have been tongue tied but you expressed exactly what I would like to write in my 1st anniversary post soon. What a wonderful world this blogging world is, how exciting, so many new friends and yes, difficulties too (technology, photos, inspiration…). Glad to have found you. Wow I can’t believe it!! 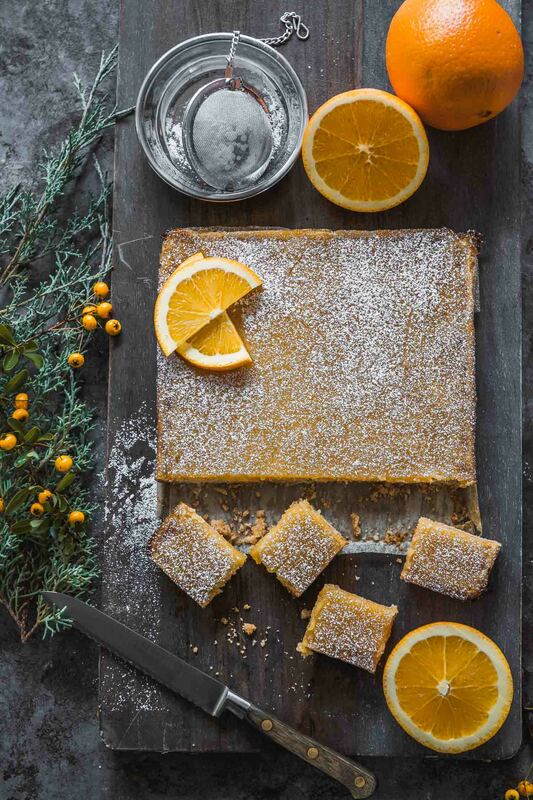 Happy birthday to Lemons and Anchovies and with the perfect dessert to celebrate. I am so happy to have found your blog Jean your love and passion completely transfers to every one of your dishes. Your family is lucky to have such a talented mama 🙂 I look forward to getting to know you through more wonderful stories and recipes and wish for several other birthdays for L&A. Congrats!! !